Above is the photo of Himiko, a boat designed for the Tokyo Cruise Line by Reiji Matsumoto, a famous Japanese anime and manga creator. Himiko is designed like a spacecraft, the glass-roof and body allows tourists all round view of their surroundings and also make it easy to take photographs. On January 27th, 2008 we rented a boat to cruise Tokyo bay for six(6) hours from 10.00 a.m. to 4.00 p.m. This has been one of the best trips I’ve ever taken. We cruised everywhere within the Tokyo harbor starting at Edogawa Marine club through Meguro and Sumida rivers, passing by Odaiba and the Rainbowbridge to DisneyLand. It was an opportunity to see the beauty of Tokyo from the sea and without the inner city crowd. During the cruise we saw Himiko(above) and many other sightseeing boats. Below is our group photo, taken before we left Edogawa Marine Club. 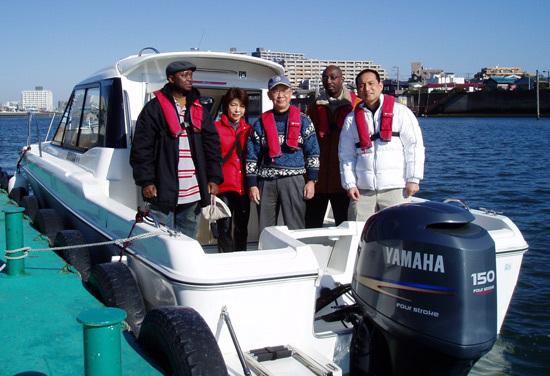 From left: Bariton Okori(me), Mr.& Mrs. Arakawa, Felix Missiala, Katsuhiko Egusa - our captain/pilot, he acquired his boat license in september 2007.